Professional quality badge with pin on back. Size is 3 inches by 2.25 inches. These badges are available in Nickel or Gold finish. Text says Bail Enforcement Officer on enameled scrolls. Click on the picture of the badges to enlarge and show detail. 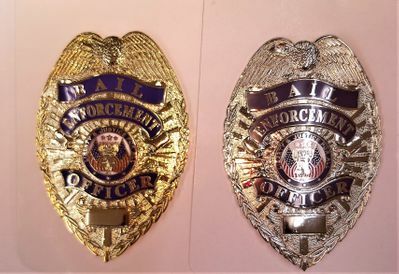 Every Bail Enforcement Officer needs a badge to identify them as they carry out their duties in apprehending those that fail to show up in court. 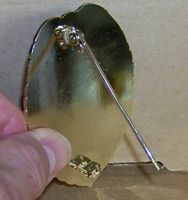 We have for sale the professional, shield-shaped badge for you in a gold or nickel finish. The large lettering situated on a blue enameled banner announces your position and purpose to anyone you encounter. The Bail Enforcement Officer Badge is held in place with the vertical pin and clasp attached security to the back of the badge and can be pinned to your shirt, jacket or waist band. The badge also attaches well on a neck chain holder, clip-on belt holder or in a flip-out badge wallet. The badge is well designed and features an eagle with a wing span the width of the badge as well as red, white and blue American flags. Other detailing includes a border of leaves that surrounds the outer edge. It is 2.25 inches wide and 3 inches long and is made of heavy duty metal. Complete your Bail Bond Enforcement Gear by purchasing one of these badges. If ordered by 1 p.m., your badge could be on its way the same day. The drop down menu lets you select which finish you prefer.